If sweets are a sure bet at any gluten-free products expo, placing as runner up for the next most-represented category is the carbs: breads, cereals, pastas, and pizza. Years ago when I first went gluten-free, the breads, pizzas, and pastas I ate are practically pieces of cardboard compared to the offerings I found on the show floor. 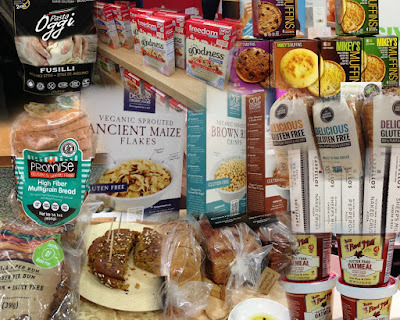 While some of these brands may be familiar to you, most were new to me, which is cool because the increasing quality of breads and other products means the gluten-free standard is getting higher and higher which means that being gluten-free no longer means that we have to settle for subpar substitutes of our favorite gluten-filled goods. The first breads I sampled on the show floor were Little Northern Bakehouse's seeds & grains and millet & chia breads (they also make a cinnamon raisin but I'm not a cinnamon raisin person). I was impressed by the delicious right-from-the-bag taste and texture, which also performed well when toasted. Both had a "breadiness" that's often lacking from gluten-free breads, and also happen to be vegan, which makes those needing multiple-allergen friendly breads pretty happy! Read more about them on their website. The paleo diet and bread are not usually thought of together, but Mikey's muffins proves that six simple ingredients really can make a health-conscious English muffin. I tried the original and toasted onion muffins, and like the chewy texture and bread-y taste. Free from grains, gluten, dairy, or soy, this product definitely capitalizes on the versatility of almonds. Click here to learn more about Mikey's Muffins. Previously mentioned on my sweets recap for their decadent brownie bites, Spiffy earned their second appearance due to their line of dairy-free sandwich breads. The bread I tasted had an incredible texture and taste, and had the look and feel of true artisan-made bread. This new-to-America brand's parent company is Maison Cannelle, and you can learn more about them here. I am highly anticipating another look at these products. No matter how many gluten-free bagels are on the market, I am always open to sample the latest to the field. Flax4Life's newest bread offering. I loved the chewiness of this bread as well as the distinctive taste of the various seeds and seasonings that render the "everything" distinction. As an added bonus, this bread packs flax seeds, protein, and fiber. Visit Flax4Life's website to learn more. Promise Gluten Free's multigrain bread not only impressed me with its nice bready taste and seeded texture, but totally bring their nutritional "A" game with more fiber, less sugar, all with no dairy, soy, or nuts. The two staffers I spoke with informed me that the brand is slated to be carried by CVS Pharmacy, which is a great leap for gluten-free consumers. Learn more about Promise and their full range of products on their website. I am a huge Bob's Red Mill fan, specifically for their gluten-free oats. Getting out the door to my 8am classes just got a whole lot easier with the introduction of their new oatmeal grab-n-go cups. Offered in four new flavors, I especially loved the brown sugar and maple cup for it's perfect amount of sweetness. These quick certified gluten-free oats are made with flax and chia to boost nutrition. Click here to learn more. One Degree Foods is a brand I've seen come to store shelves, but have never personally tried. The three gluten-free cereals currently offered are veganic (ingredients have no contact with animals or animal by-products), organic, and tested below 20ppm. I sampled the cocoa crisps, which perfectly balanced cocoa and sweetness. One Degree also allows customers to actively trace the ingredients that went into the exact box they bought, which is super cool in my book. Visit One Degree's website to learn more. I am already a super fan of Freedom Foods, after all I adore all of this company's cereal products which are free from top allergens. Making their debut this year was the All Round Goodness and Fruity Rainbow Rocks. The former is a delicious take on "O" cereal, made without oats for those who are sensitive to them, and comes in two delicious flavors- plain and maple. The latter is a fruity cereal that is sure to bring a smile in the morning no matte how old or young you are. After speaking with Freedom Foods' CEO, I couldn't help but fall more in love with this company and totally respect their mission to make their product top of the line and safe for those of us with dietary restrictions. Click here to check out Freedom Foods' website. After years of avoiding gluten-free pasta, I've started to branch out and enjoy it again. Oggi, a new-to-me company impressed me with their vegan fusilli, which is made in the traditional Italian way. This pasta had a delicious texture and actually twirled, a major milestone that makes or breaks a pasta in my book. Made with only six ingredients and certified with six major gluten-free certifications, stay tuned for this pasta and others in the line to hit the market. To learn more, visit Oggi's website here. Cappello's rocked my gluten-free world last year at Expo East with their almond flour based pastas and cookie dough. This year, Cappello's upped the ante with their new pizzas and pizza crusts. Made with coconut flour and completely grain free, these pizzas are sure to change the pizza game. While all but the bare crusts contains dairy, I will certainly be using the crusts to craft a custom pizza to push me through some serious study sessions. Visit Cappello's over on their website.